1 If it's not working and you hear a fairly quiet buzzing/humming sound when you turn it on this is the motor straining to rotate. Fit the allen key in the hole and try to turn it. You'll find quite stiff at first. 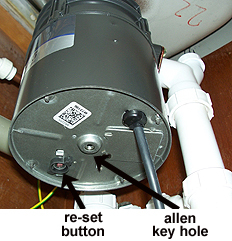 Having freed the waste disposal you should be able to spin it freely with the allen key. Remove the key and try tuning it on. 2 You will also find underneath a small round reset button. If you keep trying to turn on the unit when its jammed (and hear the buzzing /humming sound) eventually the motor will over heat an a safety cut-out will cut the power and the buzzing will stop. Free the unit up with the allen key as above.Then press the little re-set button. 3 If the reset doesn't work the unit may have blow the fuse in the switch. Try changing this. 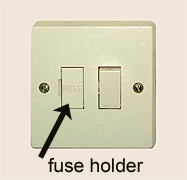 (see changing fuses) If it's been installed properly you should find a fused switch close by. Open up the fuse holder and test the fuse. Change it if necessary. 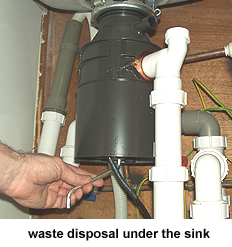 If you've tried all the above and still can't get it to work you'll need to get a waste disposal service engineer in.